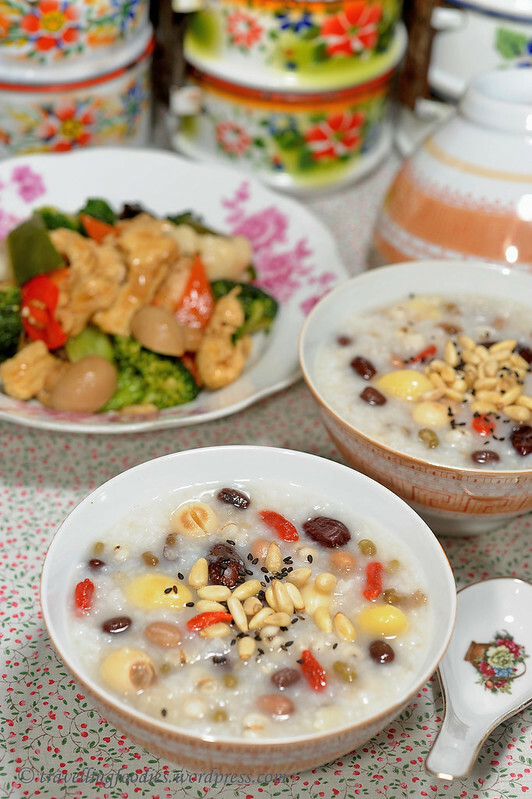 The ingredients used to create Eight Treasures Porridge is very extensive but by no means exhaustive. As with most porridges, it has a starchy rice base. And this is the only part of this dish which conforms to the norm. Otherwise, the condiments to add is basically up to the imagination. 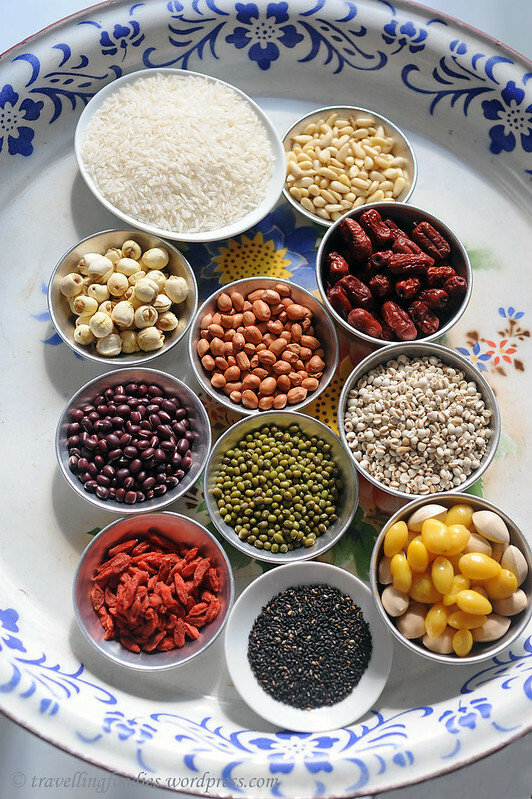 Most versions favour the incorporation of other grains, like chinese barley (薏仁), glutinous rice (糯米), black glutinous rice (紫米/黑糯米), wheat germ (大麦), millet (小米) to various pulses like red beans (红豆/赤小豆), green beans (绿豆), to nuts like peanut (花生), walnut (核桃), pine nuts (松子), as well as dried fruit and seeds like red dates (红枣), goji berries/wolfberries (枸杞子), lotus seeds (莲子), gingko nuts (白果/银杏), dried longan (桂圆), melon seeds (瓜子), sesame seeds (芝麻) and even dried apricots (杏脯) and raisins (葡萄干). 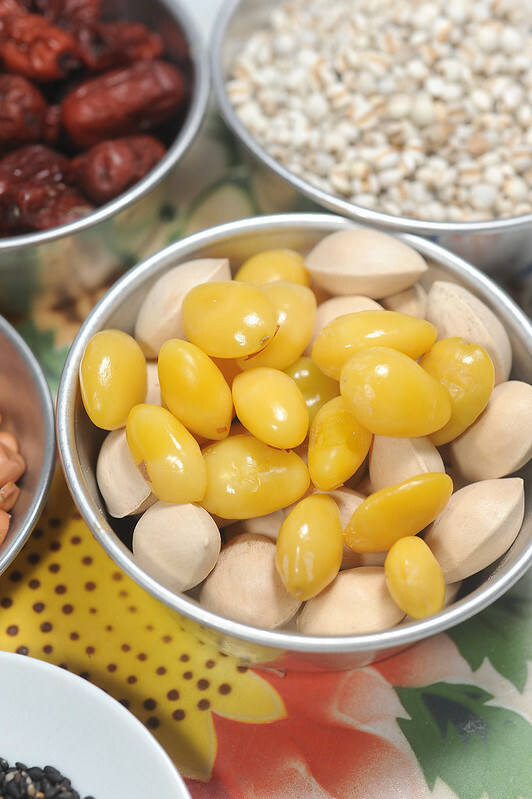 The list extends even longer to include other items which are deem to have curative properties in traditional chinese medicine, like lily bulb (百合) , dried winter melon strips (糖冬瓜), chinese yam/nagaimo (山药). 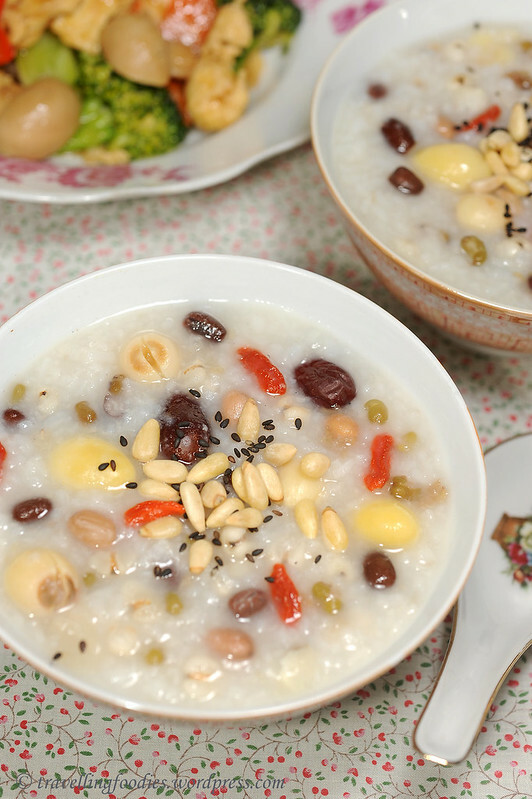 Due to the infinite number of combinations possible, Eight Treasures Porridge can be enjoyed both as a sweet dessert, or in savory broth. Meats and other vegetables can be introduced into the latter version, while others like carrot and taro (芋头) have been found in both! For this preparation, I’d decided to make it very 养生 by selecting ingredients from the five colours (青、黄、赤、白、黑) which map onto the chinese traditional medicinal concept of balance within the five elements (金、木、水、火、土) which govern the five vital organs (心、肝、脾、肺、肾). I will elaborate more on this in a later post. In a pot place peanuts and red beans. Pour in sufficient water to keep the solids submerged. Turn on the heat and bring to a boil. Turn down flame to a simmer with lid on for 20 min. Add in green beans and continue to boil until all the beans and peanuts are slightly soft. Turn off flame and set it aside, lid on. In a separate pot, add rice and chinese barley with 4 cups of water or chicken broth (for savory version) and bring to a boil. Give the lotus seeds a quick rinse with warm water and add to boiling grains of rice. Add gingko nuts and red dates as well. Strain peanuts and beans from first pot and transfer to pot of boiling rice. Continue to cook until all the ingredients are soft, stirring occasionally. Top up more broth or water if necessary. Add goji berries, turn off flame and leave lid on for 10 min for goji berries to steep. Serve by ladling into bowls and top with toasted pine nuts and sesame seeds. Red beans are presoaked overnight to hasten the cooking process. Can be omitted if a pressure cooker is used. Rinse the lotus seeds just before adding them into the boiling pot of rice and warm water must be used. Rinsing them beforehand and/or with water at room temperature would cause them to require a longer time to cook. 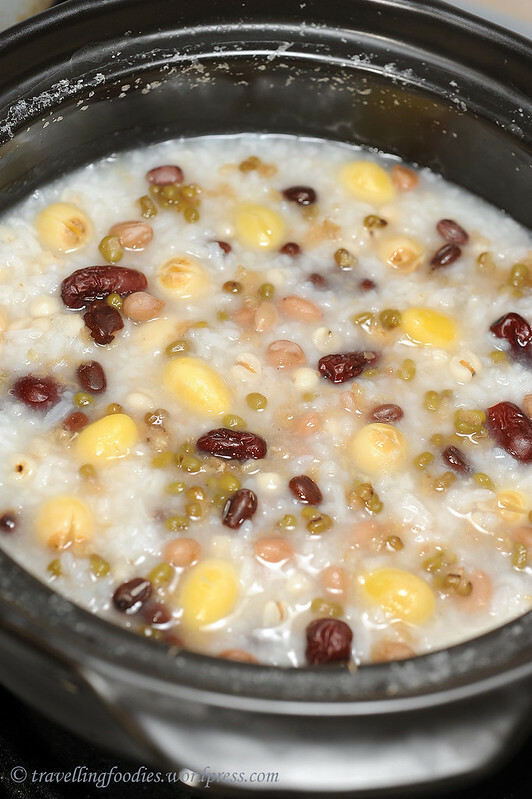 The ingredients are cooked in two separate pots to allow the porridge to maintain a clear base colour in the end for more attractive presentation. If desired, alll the ingredients can be cooked in the same pot, especially when a sweet version is prepared. Incidentally, when a sweet version is cooked, rock sugar or even raw brown sugar can be used. A knot of rinsed pandan leaves may also be added to improve on aromatics, as well as other typical sweet broth ingredients like candied winter melon strips or dried longan. 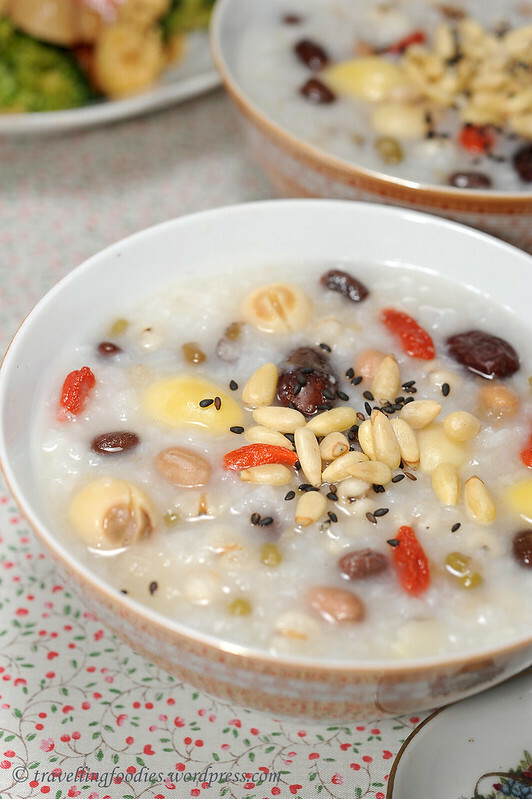 Despite its name, there is really no limit to the variety of ingredients that can be added into making this porridge. I’d used 11 but one more or one less, it doesn’t really matter. So cook a piping hot bowl of Eight Treasures Porridge for yourself and family, the perfect fix for a cold and rainy day like this. This entry was posted on January 19, 2013 by Alan (travellingfoodies). It was filed under Food, Simple Eats and was tagged with black glutinous rice, chinese barley, chinese yam, 瓜子, 白果, 百合, 糖冬瓜, 糯米, 紫米, 红豆, 红枣, 绿豆, dried apricots, dried fruit, dried longan, dried winter melon strips, Eight Treasures Porridge, 腊八粥, 芝麻, 花生, 莲子, 葡萄干, 银杏, 薏仁, 赤小豆, 黑糯米, gingko nuts, glutinous rice, goji berries, green beans, hinese barley, laba porridge, legumes, lily bulb, lotus seeds, melon seeds, millet, nagaimo, nuts, peanut, pine nuts, pulses, raisins, red beans, red dates, rice, seeds, sesame seeds, walnut, wheat germ, wolfberries, 养生八宝粥, 坚果, 大麦, 小米, 山药, 杏脯, 松子, 枸杞子, 核桃, 桂圆. I always enjoy coming in here to read. I have learnt so much from you. Keep it up. Thanks Edith! I’m glad you started your new blog! Hope to see more wonderful entries from you as well! 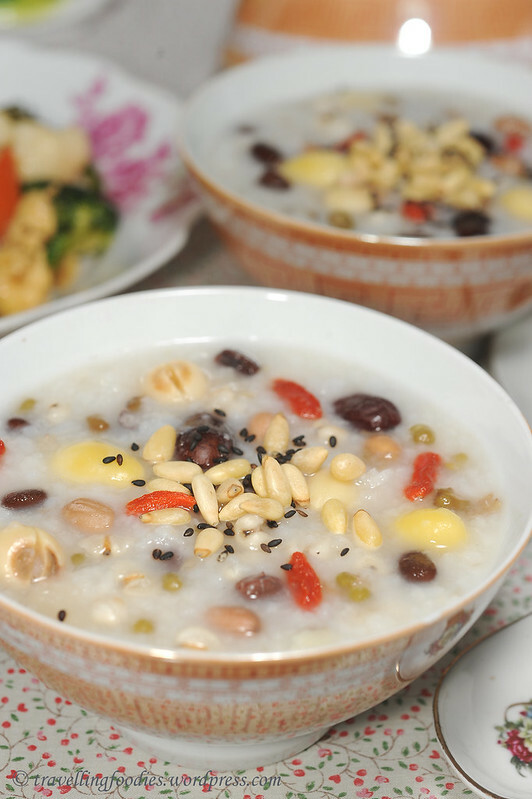 Pine nuts on congee! 🙂 Dats a first for me….r those some vintage tiffin carriers in the background (2nd pic)? They look soooo beautiful! and how i love those tingkat! yes, very nutritious indeed with all the grains, pulses and dried fruit added! Give it a try, Alice! all the while i thought this porridge comes in savoury version only, didnt know about the sweet version too. Hey, you can submit this to sonia’s event i think. 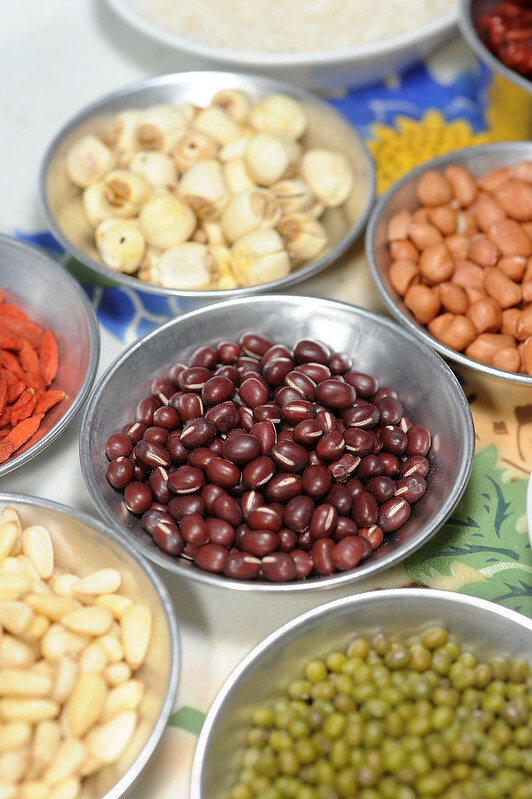 so you put 11 types of grains and nuts then you shld call them 十 一宝 粥! LOL! I’ll try to submit this for Sonia’s event. Thanks for the heads up, Lena! Hi Alan! I remember having this when I was in Taiwan for military training during my active national service time 20 years ago…. and it was from a can!!! But tasted so good. oh yes! I had those before as well! Those are sweet desserts convenient in a can Shall try to make a sweet version one of these days!